Black Note E-Liquid is very special stuff, indeed. If you’re a fan of tobacco E Juice and you want the highest quality possible, Black Note is the market leader right now. By a considerable stretch. No one else puts this much effort into making E Juice. 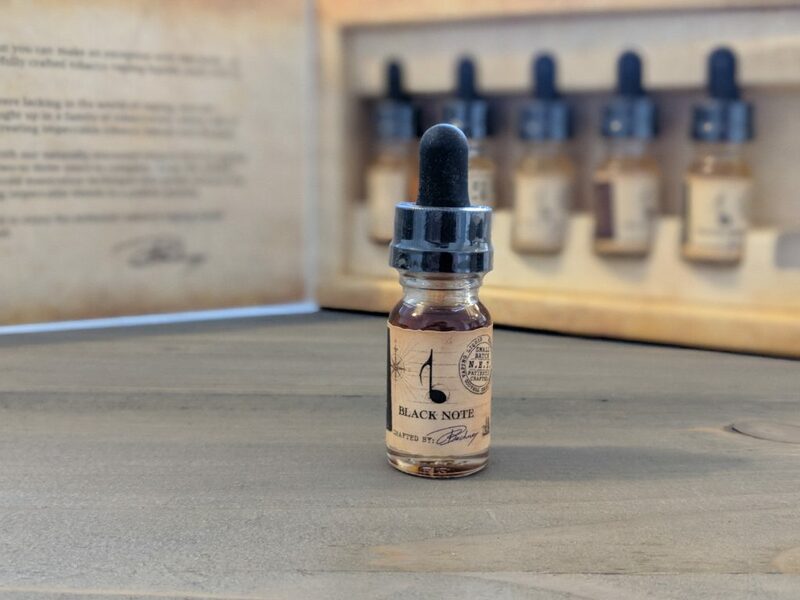 All Black Note E-Liquid is sourced from actual tobacco leaf. That means all the flavors are 100% natural and there are zero flavorings or additives inside the juice – everything is 100% natural. You have plenty of “blends” to choose from as well. I say, blends because that’s what they are – different blends of different tobacco leaf. You have sweet and delicate blends and heady and intense blends. Basically, a ton of variety. And they all taste great. 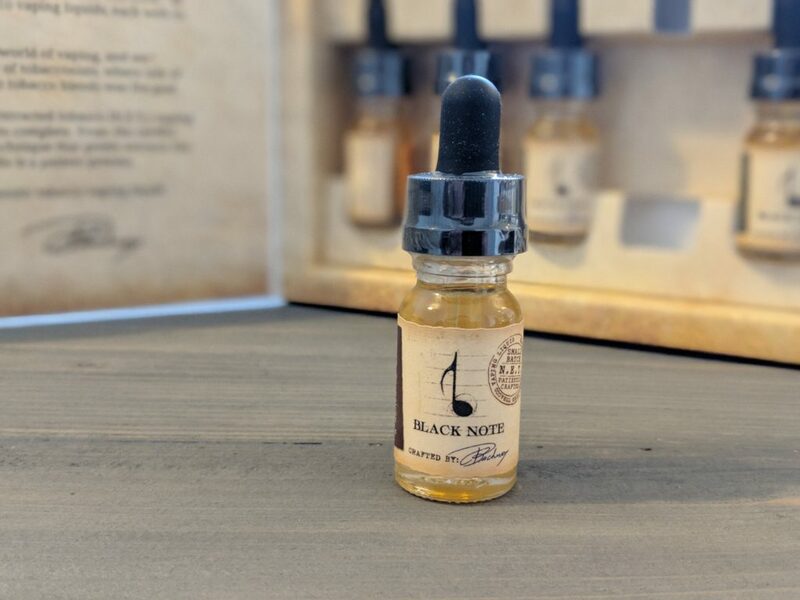 If you were a tobacco snob when you smoked, and you’ve been looking for a pure, completely natural, great-tasting tobacco E Juice, you 100% need to check out Black Note’s range. There is nothing else quite like it around right now. Hence why it is revered as the world’s #1 tobacco E Juice brand. If you’re a fan of tobacco E Juice and you don’t know about Black Note, well… you’re seriously missing out. Black Note E Juice is regarded as the most accurate and premium tobacco E Juice on market right now. So how is it? Tricky to say, really, as I’m not the biggest fan in the world of tobacco flavored E Juice. I don’t mind it, but I’d never buy it out of choice. Why? Simple: like a lot of vapers, I prefer sweeter, fruitier flavors. But when you run a vape blog, you have to be open to new things, so when Black Note’s The Notebook turned up on my doorstep, I dusted off an MTL tank and got stuck right in. I just figured this being a tobacco E Juice, I might as well get as close to that smoking-feeling as possible. I tested all of the Black Note E Juice flavors over the space of a few days using a Kayfun tank on my VooPoo DRAG. I should also clarify what The Notebook is too. 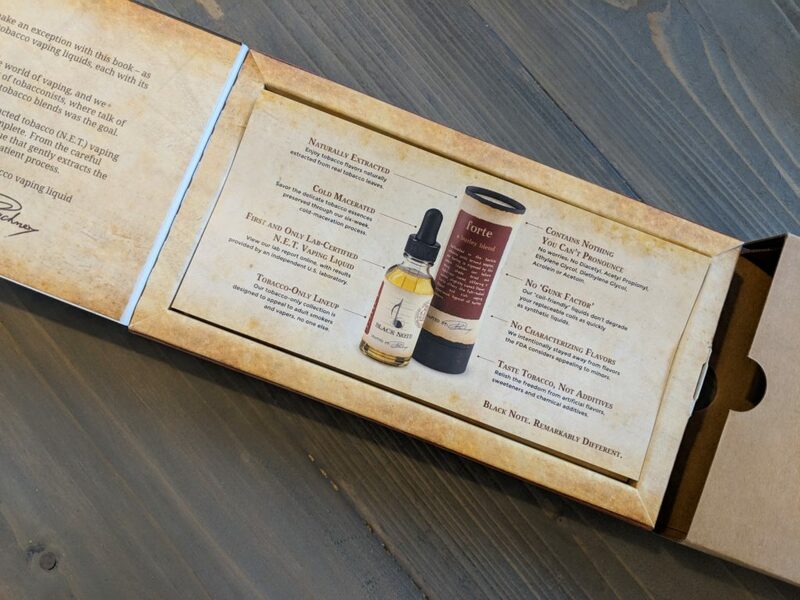 Basically, it’s a box that contains a selection of Black Note E Juice flavors so you can try all the different tobacco blends. The Notebook that Black Note sent me is actually the company’s third edition; unfortunately, I haven’t tested the ones that came before. The Notebook Box contains six bottles of E Juice in 10ml bottles. It’s basically a sampler pack, ideal for those that want to test a variety of blends before committing to a larger bottle. I like this idea, especially when it comes to tobacco flavored E Juice, as there is a lot of difference between the many, many available blends of leaf out there. 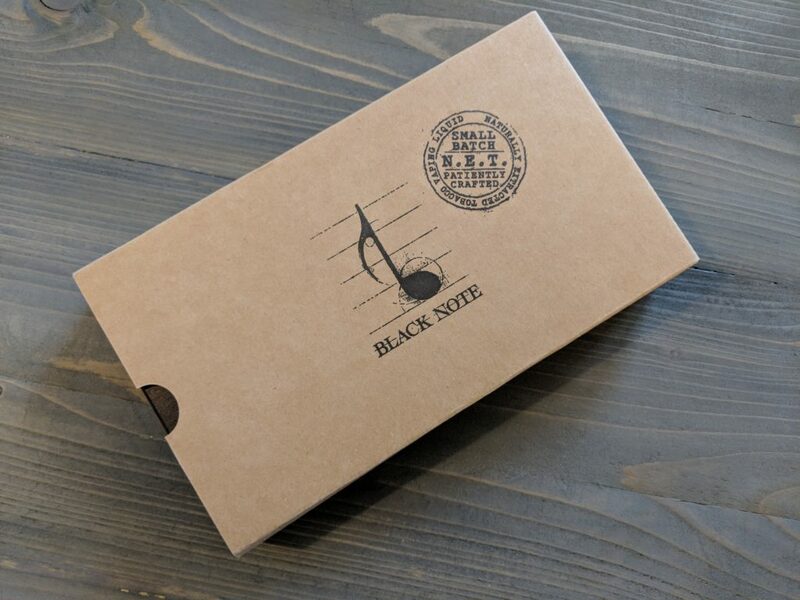 Black Note’s E Juice line is not just “tobacco flavored” in an arbitrary sense; rather, the flavor ACTUALLY comes from real tobacco leaves which ensures all the flavor profiles for the different blends are spot on. On top of this, the flavors are extracted using a technique known as cold maceration process, which takes SIX WEEKS to complete. This process ensures all the delicate notes of the tobacco leaves are retained in the flavor profile of the E Juice. There are also ZERO addictive; so, no artificial flavors, colors, sweeteners, or chemical additives (and that includes: diacetyl, acetyl propionyl, ethylene glycol diethylene glycol, acrolein, AND acetone). Why? Again, pretty simple: Black Note is targeting its E Juices at adult users – those that like tobacco flavors and appreciate good quality ingredients. The entire philosophy of the company is based around extracting and creating the purest, more exact replication of the finest tobacco leaves on the planet. Yes, it’s very good. But there is a massive caveat here – you HAVE to enjoy the flavor of tobacco, otherwise, you’re going to be very disappointed. This stuff is not designed to taste like cereal or ice cream or Lion bars – it is unapologetically ALL about the tobacco. Back in the day, I used to smoke roll-ups; Golden Virginia was my favorite, usually with a menthol filter. I always preferred rolling my own over ready-made stinkies because A) they tasted better, and B) they were A LOT cheaper. I also loved trying different flavors of tobacco whenever I was near a decent tobacconist. Cherry was my bag back then, but I also tried an array of different American blends in my quest for the ultimate roll-up. This means I know quite a bit about how quality tobacco tastes, which was why I was so impressed right off the bat with Black Note’s E Juice – it is so close to the real thing, it’s kind of scary. I mean, it was like I was back in tobacconist, smoking some premium tobacco leaves. I said at the beginning of this review that I don’t really like tobacco flavored E Juice. And that still stands. But for Black Note I made an exception because its E Juice line is so damn good, it’s almost like you’re actually smoking again, which, for many people, will be a huge deal. I was honestly blown away by how good Black Note’s E Juice was; it tastes like the fine tobacco I used to spend A LOT of money on back in the day, the kind of stuff I’d happily pay £15 to £20 for per 25g pouch. If you’re into tobacco flavored E Juice, you simply must try Black Note’s E Juice line. 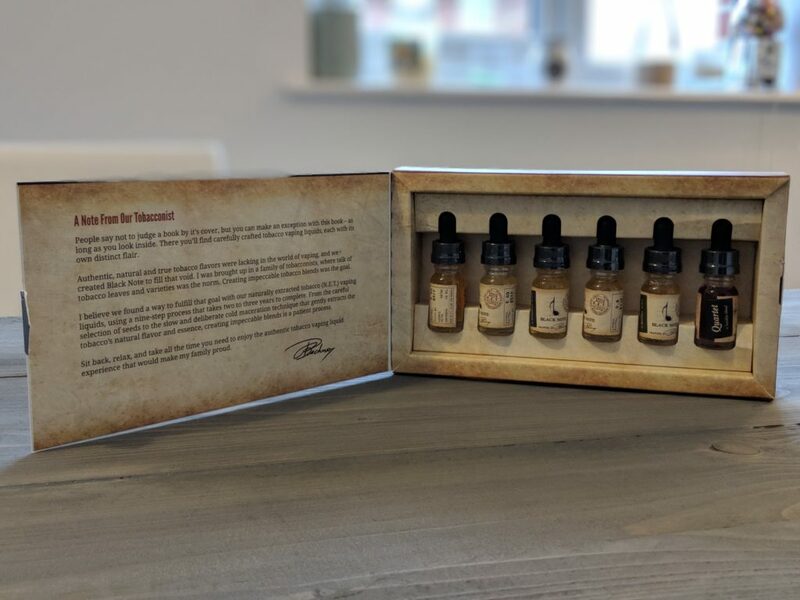 Everything about this brand is executed perfectly from the science behind how the E Juice is created to the choice of blend it offers, and the packaging it comes in.